The yellow flowers that bring me sunshine are two varieties of Rudbeckia fulgida. I can rely on ‘Goldsturm’ and ‘Deamii’ to put on a fuss free, dazzling show between August and October. Like it or not, gardeners are indebted to Carl Linnaeus (1707-1778) for introducing the two-part classification of plants, evidence of his legacy is in the naming of the genus ‘Rudbeckia’ after both his Swedish botany teacher Olof Rudbeck and Olof’s son. Although native to North America Rudbeckia fulgida var. sullivantii ‘Goldsturm’ was discovered in a Czechoslovakian nursery in 1937 by Heinrich Hagemann, at the time he was an employee of Karl Foerster, the famous German nurseryman and the ‘godfather’ of ornamental grasses. Rudbeckia fulgida var. 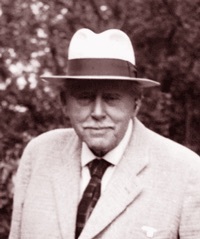 ‘Deamii’ is named after an Amercian botanist Charles Deam (1865-1953) who found the species growing in the wild, probably in Indiana. Both varieties are fully hardy in UK gardens and have earned the Royal Horticultural Society’s prestigious Award of Garden Merit. The species epithet ‘fulgida’ means ‘shining’ or ‘brilliant’, so it’s no surprise orange coneflowers add a warm glow even on overcast days. 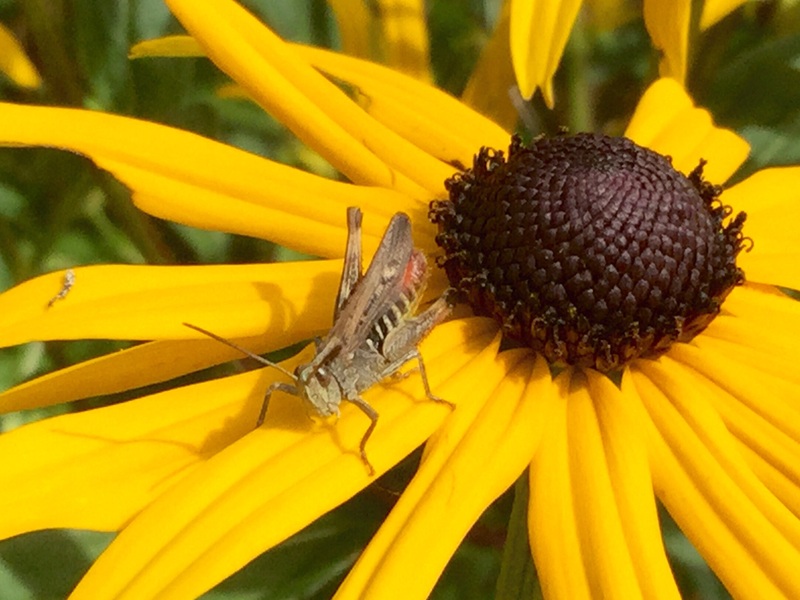 The flowers are a magnet for insects and some like this grass-hopper are happy to pose for the camera. Rudbeckia is easy to grow in moderately fertile, moist but well-drained soil. Once established this is a reasonably drought tolerant, low maintenance plant. Fabulous seed heads stand well right through the winter, by March there’s very little tidying up to do. Rudbeckia is an archetypal prairie plant, used in a matrix of grasses and other flowering perennials it looks at home in our stylised meadow. 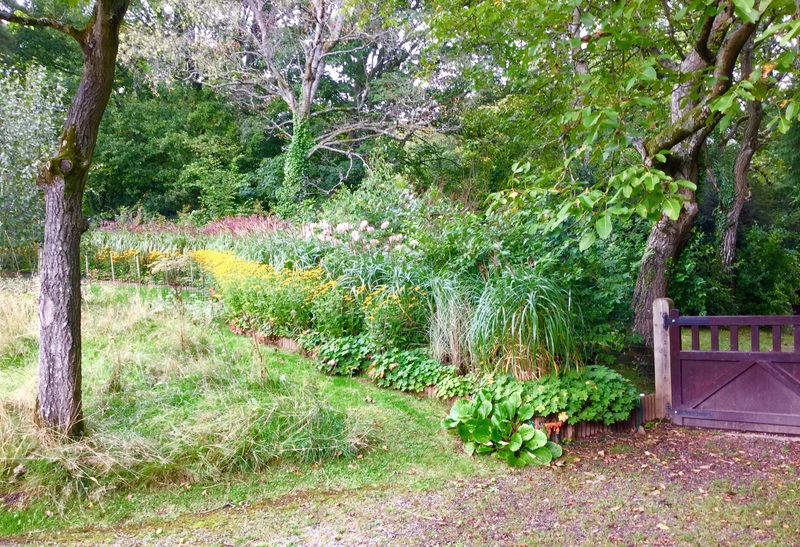 In an unpampered naturalistic planting like this, the plants are left to fend for themselves. In these conditions Rudbeckia ‘Goldsturm’ remains compact, flowering at 3′ in height. However, in improved clay soil Rudbeckia ‘Goldsturm’ flexes its muscles to reach 4′ in height and shows how it excels as a chocolate studded quilt in mass planting schemes. 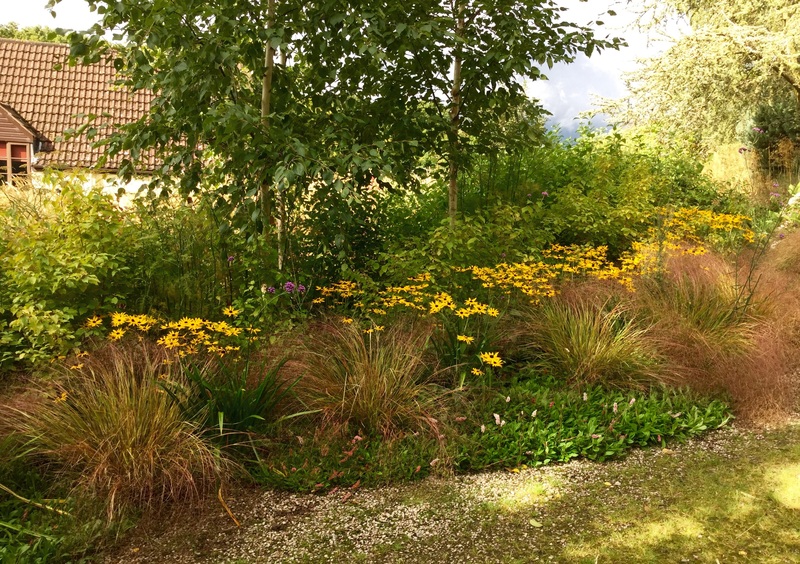 Planted as small plugs in front of a 70 metre hedge of Miscanthus sinensis ‘Malepartus’ in 2012 the rudbeckia has benefitted from the TLC lavished on establishing the slower growing grass and quickly filled its allotted space. New plants are easy to come by, in spring simply pull the rhizomes away from the main plant in situ and grow on until they fill a 9cm pot. 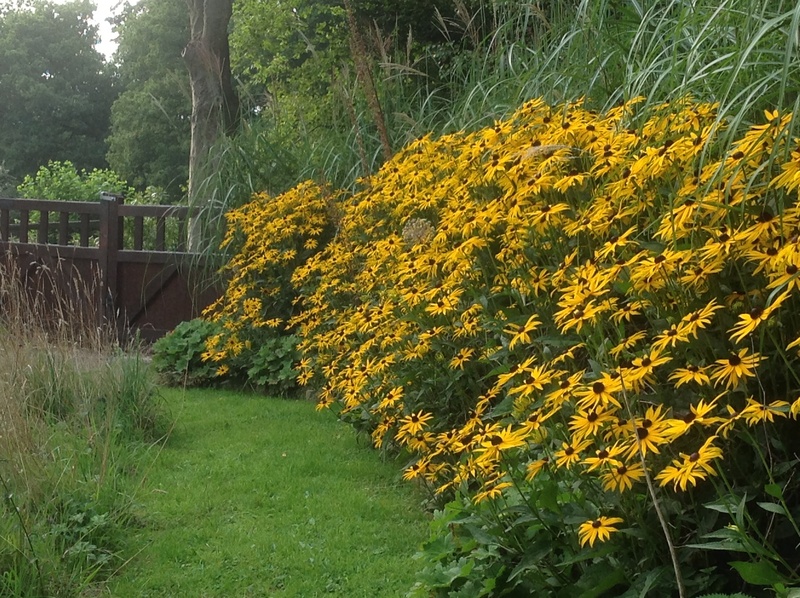 Over most of the 70 metre stretch of miscanthus hedge the rudbeckia fares well and in September reaches a peak. As a member of the daisy or Asteraceae family, and so related to sunflowers, Rudbeckia fulgida likes full sun but is also tolerant of partial shade. However, in the shade of walnut trees, at the other end of the hedge, there is a glaring gap. Perhaps the ground is too dry; perhaps rudbeckia is just more sensitive than it should be to the growth inhibiting juglone secreted from the trees’ roots. Whatever the cause, several were moved to the meadow this spring – hence the gap. Grasses struggle in the same spot too, divisions of the more shade tolerant variegated Miscanthus sinensis Morning Light (second patch from the left) look unhappy too. ‘Morning Light’ should look like the parent plant standing guard to the left of the gate in a mixed planting in the back garden. This is an awkward east facing bed planted in builders infill beside the house, theoretically both the rudbeckia and miscanthus should do better in the west facing border in the front garden. Back in the front garden in an area of dappled shade Rudbeckia ‘Deamii’, Anemanthele lessoniana and Persicaria affinis add splashes of late seasons colour. The trio of perennials share an equally vigorous nature, all are capable of nudging more delicate neighbours aside. In full sun and in the free draining raised terrace in front of the house ‘Deamii’ is shorter at about 2′, just the right height to conceal the tired summer foliage of Calamagrostis x acutiflora ‘Karl Foerster’. This is a classic, much copied planting combination, in my case the inspiration came from my much thumbed ‘bible’ the RHS Encyclopedia of Perennials (Dorling Kindersley, 2006) in which an image on page 411 looks almost identical to the one Gordon took last year (; . 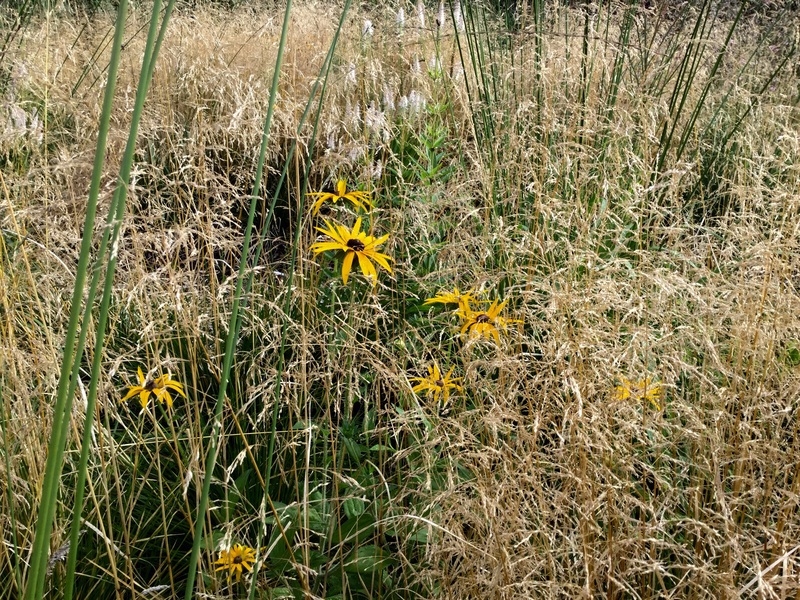 Reading the accompanying advice makes me smile : “the rudbeckia and the grasses have the upper hand … intervention may occasionally be needed to allow the other perennials to develop”. Good old RHS, right as ever : the cerise pink pokers of liatris (to the right in the image above) turned out to be SOS flares. 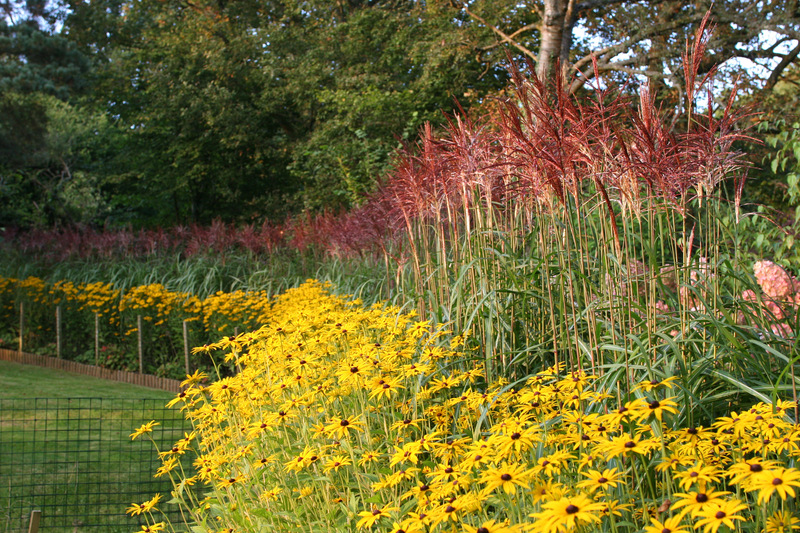 In 2015 the grasses terrace perennial planting consists of three metre wide bands of calamagrostis, rudbeckia and nepeta that stretch along the length of the border – sadly, minus liatris. The design appears linear or more fluid depending on the vantage point. From the top of the bank the serried lines echo the sense of the gentle slope and curving terrace walls. 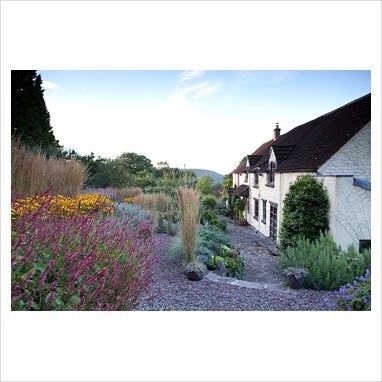 Beki’s photograph captured the quieter early morning mood and drift of the planting, it was part of an article ‘The Late Bloomer’ featured in The English Garden magazine last September. In all other respects the planting has filled out but hasn’t changed that much since this photograph was taken in 2012, the first year of planting. 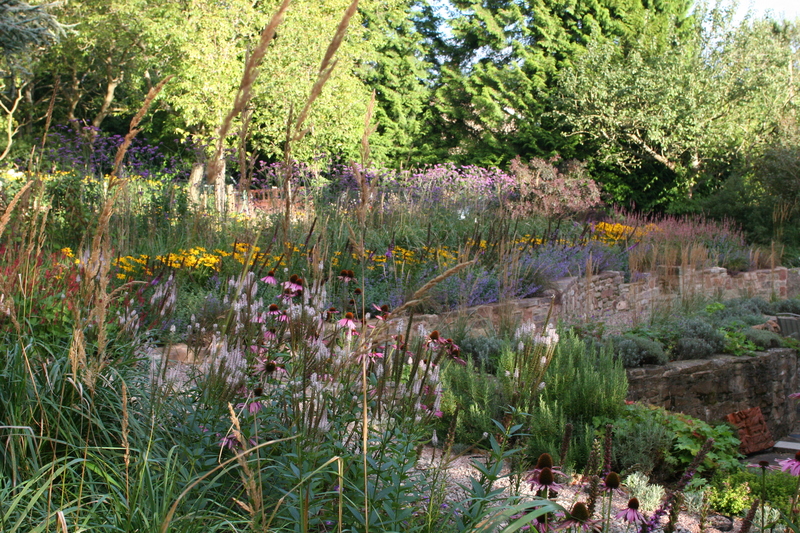 Three years later, the view of the grasses terrace from the corner of the round bed looks like this. The rescued liatris has perked up in the company of another member of the daisy family, Echinacea purpurea. Both these pink perennials are inclined to ill-health in my garden, perhaps that’s what makes them happier bedfellows? Unless ‘he’s’ had a haircut the echinacea’s common name of ‘Black Samson’ seems a bit of a misnomer. 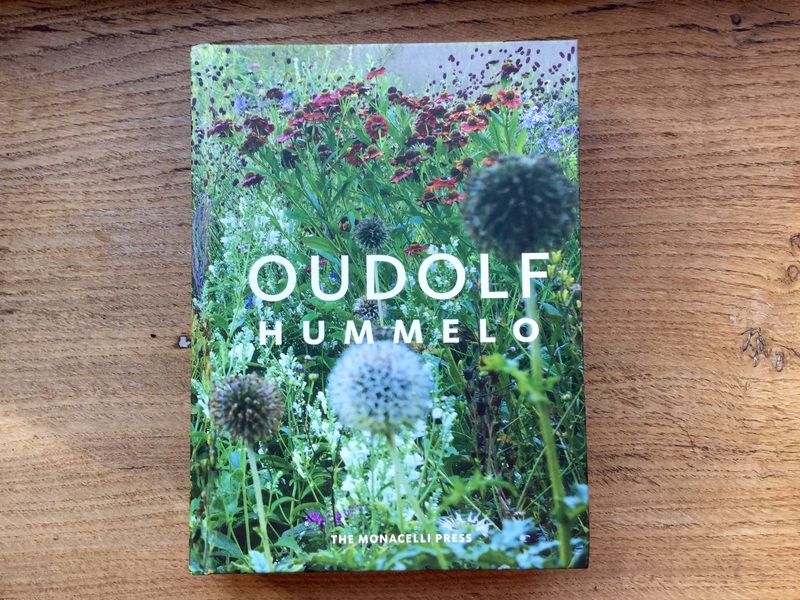 I’ve found it hard to come by information about the origins of and influences behind the New Perennial movement, including the late great Karl Foerster so it’s wonderful that the gap has been filled in the recently published Hummelo by Piet Ouldolf and Noel Kingsbury (The Monacelli Press, 2015). With a gorgeous front cover this is definitely one for the top of a winter reading list. Thank you, Christina, that’s high praise coming from you. 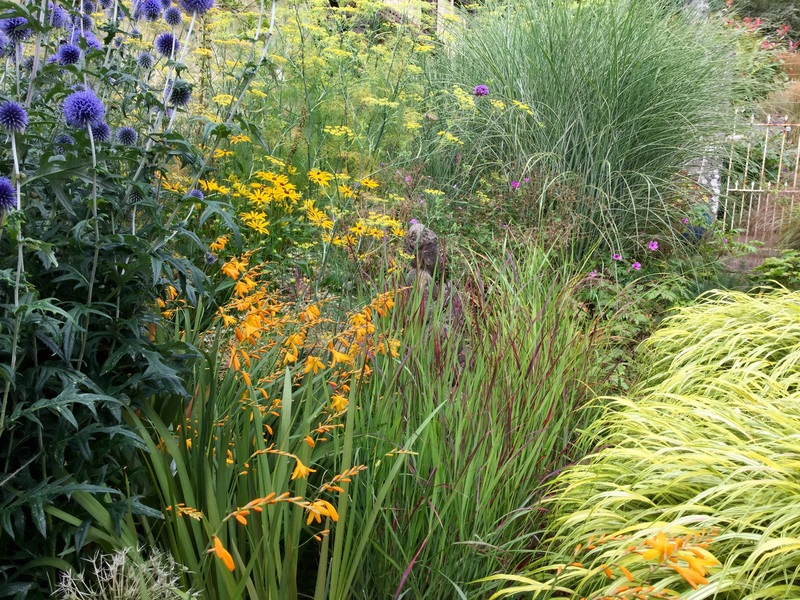 In some ways I find easier restraining the pallete of plants in the larger areas of the front garden, in the back garden which was planted earlier I made mistakes in smaller areas. In fact, I’m still unpicking some of them! Stipa gigantea looks wonderful massed, mine self sow in gravel, the seedlings that are a bit top heavy and wobbly for a year or so. Though I’ve not tried it, a friend successfully divides her stipa. Standard advice is not to transplant stipa, but I have them many times and not lost one (yet). Good luck with yours. Thanks for the advice, I do have at least one quite large seedling I will move. You are so knowledgable Kate and casually throw in all sorts of useful information into your posts. I am trying again with helenium this year and hope it establishes as well as yours although I don’t want a 70m clump of it! That’s a kind thing to say, Cathy, thank you. I love finding out as much as I can about the plants I grow, especially my grasses. I’ve been trying Helenium ‘Moorheim Beauty’ this year too, in large pots which may not be ideal. They are very colourful too. I hope yours does well. And I have now realised that I referred to the Helenium as the 70m hedge and not the rudbeckia – silly me! 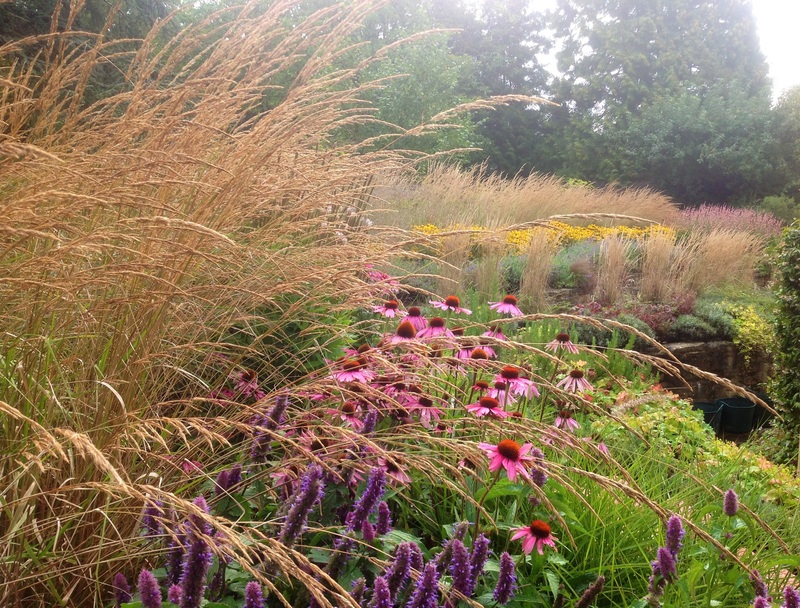 Oh wow again – the mass plantings are fabulous! Thank you Yvonne, this is the garden at its most exuberantly colourful, sun glasses are required on a sunny day. If I may reply to your comment on persicaria here, I’m pleased you have your priorities right – I can never ignore a thirsty plant either. Excellent article and stunning photographs of what is clearly a carefully thought out garden. I am in my first year of my garden which has never been cultivated before, previously a paddock for goats.i would be very interested to hear more about your “in improved clay soil” My soil is so heavy that I fear I may lose some plants this winter if we have a wet one. Any tips gratefully received! That’s a lovely compliment, thank you, I did start my making a full structural plan for the front garden. In a nutshell : diggers trenches and riddled the rocks, masses of organic matter was added, 4-6″ of bark chippings to suppress weeds. Membrane is useful, anything from old carpet to cardboard. Which magazine online did an excellent article on clay busting. Maybe I should try a post about how we converted our field to a garden? Good luck with your field, it sounds an exciting challenge. Well I would certainly be interested to read how you did it. I am planning a major mulch this Autumn and was considering bark chippings but really dislike the smell. By organic matter do you mean manure? Or leaf mould? Of both? ( so many questions! Yes, anything that will open the texture of the clay and improve drainage – straw is good, a bonus of growing lots of grasses. There is a commercial straw product, I shall see if I can find the name for you. Peat is still considered one of the very best soil improves😕. Coir is an alternative😊. Love your long drifts of flowers and grasses. When I started here I just wanted one of everything, but soon learnt that drifts look a lot better. 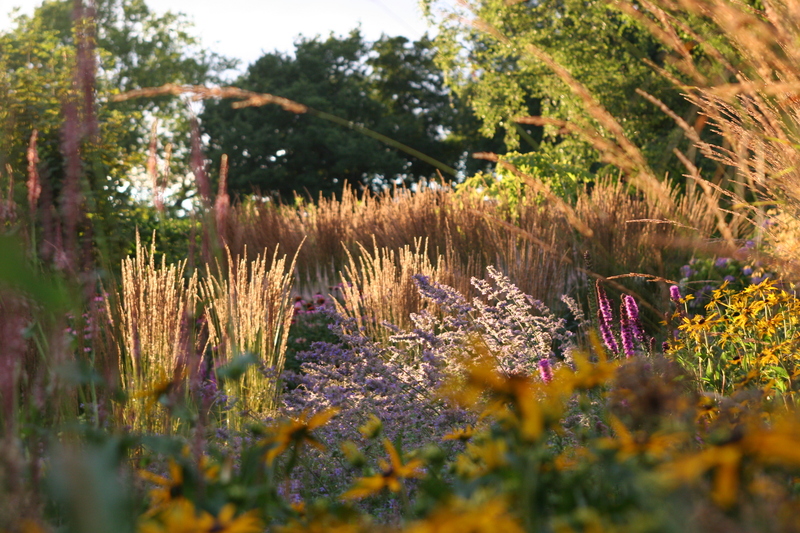 You certainly have created a beautiful garden with all your grasses and prairie plants. I agree lots of the same plant creates an impact. Yet in the meadow area the single flowers dotted through the grassesare surprising me. I’m pleased you like the planting. Your plantings are just dreamy, wonderful ribbons of colour and the scale is breathtaking. I love the mood in Rebecca’s photo. It must be like living in a painting! Yes, it’s an atmospheric image and a lovely momento of the terrace at this time of year. I appreciate your comments about the planting, the simple scheme came about to address the slight slope, also had to be very low maintenance. Keeping the variety to a minimum and matching their vigour was the key. I’m still amazed at how well it has worked, all thanks to these remarkable plants. ps. The liatris really adds to those combos. At first I thought it was hyssop, but it is much stronger presence and better for it. Have you tried hyssop at all though? You’re right! The purple spires in the front corner are hyssop, seedlings from agastache black adder, oops, liatris is just round the corner … Thanks for pointing this out to me 😊. They don’t last long in our heavy clay, winter wet sees them off, but they are easy from seed and brilliant fillers. Have you noticed how the leaves smell of black currant? Both are great through the winter for spiky accents. Breathtaking photographs of your late summer garden. Is Rudbeckia what my grandmother used to call “Black-eyed Susan”. Yes! I’ve never grown it but it’s one of those plants that I will forever associate with my childhood. The textural black middles reminding me of my grandmother’s silk embroidery. I would love to try miscanthus again. I had a bad experience with a clump I planted over 10 years ago but I know Malepartus is a newer cultivar and lower-growing than the 8 foot monster I grew! I’m really enjoying reading your posts and learning so much from your first hand experience. Thanks Kate. My Dad calls them that, too, he lives in Ontario … maybe it’s a North American nickname? Malepartus is one of my favourite miscanthus, it’s tall though! Dwarf cultivars might be worth checking out, I grow several and will review them (soon). As they are flowering from now you might find nice ones offered in your garden centre, we’re lucky that those presented for sale are generally reliable selections. It’s a good time to be planting them too. Knoll Gardens is great for seeing the range online and has good advice about what to choose for which site and how to care for them. What an interesting post and so informative. Just the sort of thing I enjoy. I didn’ t know where the name rudbeckia came from, thanks for this. Your garden is amazing, Kate, I always love looking at your photos. Thank you, what a nice compliment. Rudbeckia is very photogenic ;) .